08 Jan 2012 - Well, the 2011 Kansas cyclo-cross season series have been tallied, and Osceola Velo Club's Pat Schlager finished in 15th place (out of 38 competitors) in the Single-Speed Category in the 15-race Kansas Best Cyclo-Cross Rider (KBCXR) series and in 8th place (out of 27 competitors) in the Single-Speed Category in the 8-race Series 60 CX series. Way to go in your first CX season, Pat! 31 Dec 2011 - Osceola Velo Club's Pat Schlager was on hand for the final race of the 2011 Kansas cyclo-cross season. Pat S. finished 7th in the Single-Speed Category at the 'Cross Off the Old Year CX race held at Herman Laird Park in Shawnee, KS thus scoring 12 more points in the KBCXR series. Here's a photo link of Pat approaching the uphill barriers. 26 Dec 2011 - After 7 weeks of hibernating, Osceola Velo Club's Pat Schlager was back on the 'cross circuit for the Boxing Day Cyclo-Cross race in Leawood, KS. Yet another top-10 finish in the Single-Speed Category scores Pat S. 12 more KBCXR points for a season total of 40. Here's a photo link of Pat at the stream crossing. 06 Nov 2011 - Another full weekend of cyclo-cross racing for Osceola Velo Club's Pat Schlager at the 360 Cup on Saturday and the Boulevard Cup on Sunday which took place at the Stump Park in Shawnee, KS on completely seperate courses. Pat's 13th and 16th place, respectively, in the Single-Speed Category earned him only 3 more points for the weekend in the 2011 KBCXR series for a total of 28 points. Here is a photo link of Pat grinding up one of the short, steep climbs on Sunday's Boulevard Cup race, and here's another photo link of Pat deftly running through the sand pit. 24 Oct 2011 - Osceola Velo Club's Pat Schlager scores another 'cross top-10 finish, this time at the Epic-Shawnee Rescue Radcross, held at the Shawnee Civic Center Park in Shawnee, KS. Pat's 9th place in the Single-Speed Category scored him 8 more points in the 2011 KBCXR series for a total of 25 points in the Single-Speed competition. 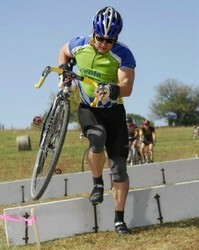 Here is a photo link of Pat running through one of the sand pit obstacles. 16 Oct 2011 - Osceola Velo Club's Pat Schlager gives cyclo-cross a try by racing both days at the Joules Cross held at the Schwada Cyclo-Cross Field just NW of Lawrence, KS. Pat finished 13th on Saturday and 6th on Sunday in the Single-Speed Category which gives Pat a total of 17 points in the 2011 KBCXR (Kansas Best Cyclo-Cross Rider) Single-Speed competition! Here is a photo link of Pat negotiating the "Spiral of Doom" on Saturday. 09 Oct 2011 - Osceola Velo Club's Pat Schlager goes "Merckx-style" at the Octoginta Individual Time Trial held on 08 Oct 2011 just east of Lawrence, KS on "old K-10 Highway." Pat's time in the cool, gusty morning was good enough for 6th place in his category. Here is a photo link of Pat blasting through the turn-around. Later that same Saturday morning, Pat rode the local recreational bicycle club's Tour de County ride and then pedaled the full 80 miles of the Octoginta recreational ride the following day. 24 Jul 2011 - Osceola Velo Club's Pat Schlager puts in a stellar performance at the 2011 Kansas State Track Championships held at the Lawrence Grass Velodrome just outside Lawrence, KS. Pat S. won the Silver Medal in his class in the 500 Meter Individual Time Trial! Pat also raced the 1000 Meter Individual Time Trial as well as the Age Group and Category Scratch Races, finishing 13th, 4th, and 6th, respectively. Very impressive, Pat! Here is a photo link of Pat's medal winning ride, and here is a photo link of Pat in his second Scratch Race. 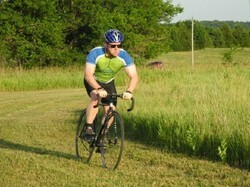 10 Jul 2011 - Osceola Velo Club's Pat Schlager goes the full distance in the 100 KM Lizard Under the Skillet recreational ride held in NE Kansas. Pat S. felt right at home in the triple-digit heat index Kansas summer weather after his 15 years of racing in Florida. 08 Jul 2011 - Osceola Velo Club's Pat Schlager posted a time good enough for 8th place in his category at the Sunflower State Games Time Trial. The 10 KM "Race of Truth" was held at the Heartland Park Motor Racing Complex in Topeka, KS. The time trial course used the complex's access roads, road racing circuit, and drag strip for an unique approach to bicycle racing. Check out the photos. 03 Jul 2011 - Osceola Velo Club's Pat Schlager lined up for the Masters 40+ race in the Downtown Criterium on the third day of racing in the 3rd Annual Tour of Lawrence. The criterium course wove its way through the streets of historic downtown Lawrence, KS. This was Pat S.'s racing debut in Kansas and the racing was full out from the starter's wistle. Here's a photo link of Pat flying through the 7th corner. 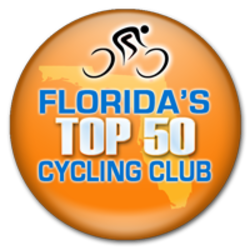 31 Dec 2010 - Osceola Velo Club voted one of "Florida's Top 50 Cycling Clubs" in 2010 by Biking.com! 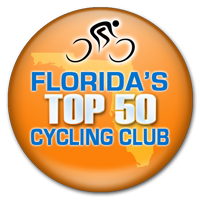 And considering just how many cycling clubs there are in Florida, being in the top 50 ain't too shabby. 21 Nov 2010 - Osceola Velo Club's Dave Zak and Jeff Blain each go the full 100 miles at the Horrible Hundred which includes all 7 of the classic climbs of the "Florida Alps" in Central FL. Check out the photos. 10 Oct 2010 - Osceola Velo Club's Pat Schlager showed off the team's colours in NE KS by participating in both days' recreational rides during the Octoginta weekend. Check out some photos of Pat S. in NE KS. Pat S. training at the Lawrence Grass Velodrome.